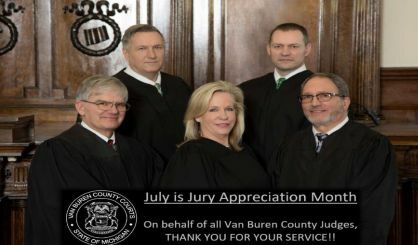 Those who make the sacrifice to serve on juries are being recognized this month with Jury Appreciation Month in Michigan. Van Buren County Trial Court Administrator Frank Hardester tells WSJM News jurors have a usually thankless job, and yet one that is very important. Hardester notes jurors are selected from the rolls of those with driver’s licenses or state IDs. In Van Buren County last year, around 6,000 people were contacted about jury duty with far fewer actually having to go to the courthouse. About 900 actual jurors were seated, and 335 questioned for a handful of trials. Hardester thanks all of those who show up for jury duty, noting that not showing up is a contemptible offense.